The Royal Ploughing ceremony, known Thailand festival, is called “Raek Na Khwan” which is translated to “auspicious beginning of the rice-growing season. ”The ceremony is held in many Asian countries and is said to mark the beginning of rice growing season. It is mean to offer a blessing to the upcoming crops and boosting the morale of many farmers who work as rice workers and earn their wages through agriculture – thus celebrating it as farmers day. The tradition is said to be originated from Hindu religion as several versions of Ramayana where Sita appear from the plowed earth where Janaka, the king used to plow the field in the royal ceremony. This is the earliest reference that can be found in the history of this event. If you are interested in knowing about the agricultural crops of Thailand, then just by being part of this ceremony you can learn a lot of agriculture specifically rice farming and different farming techniques used in this part of the world. When is the Royal Ploughing Ceremony? There is no fixed date for the ceremony, as the ceremony welcomes the start of rice growing season; the date is decided by Brahmins priests after studying the astrological events. The final date is then announced by Bureau of the Royal Household. It is considered one of the best Thailand public holidays. 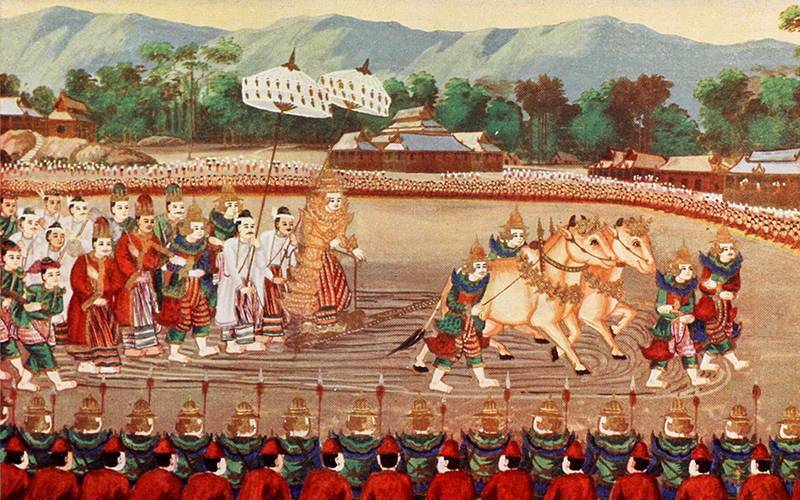 The Royal Ploughing Ceremony is a very old tradition observed in Thailand, Cambodia, and Myanmar and is used to symbolize the start of rice growing season. The tradition reflects both Buddhist and Hindu tradition and is celebrated as a reason to bless the new crops and wish the upcoming growing season to be plentiful for everyone. Thailand is known to be the second largest rice exporter and around 16 million locals are rice workers hence they earn their money through agriculture. This, in turn, highlights the importance of agriculture for the people of Thailand and therefore this festival is of great significance for its people. 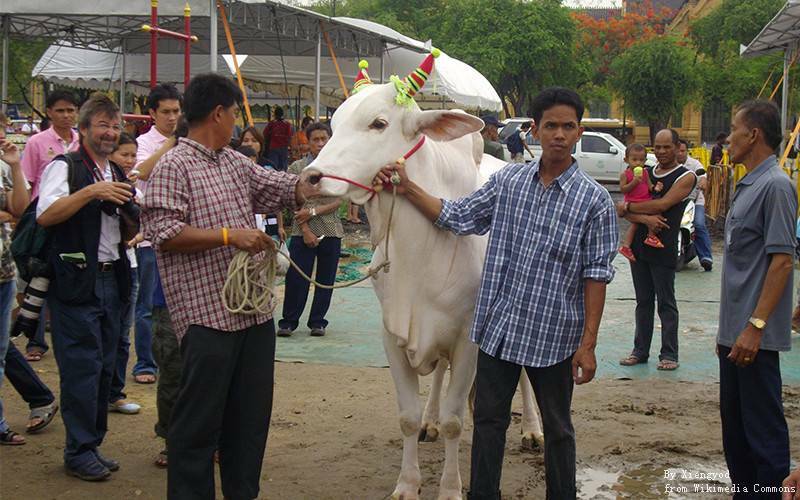 The following ceremony includes the role of both sacred animals such as ox and holy men. At the beginning of the ritual, two oxen are attached to a wooden plow through which they form a groove in the ground where Royal ploughing occurs. After that these sacred oxen are offered with a wide range of foods including corn, rice water, whiskey, fresh grass, and green beans. Whatever the oxen eat, it becomes the basis of a prediction made by Brahmins and astrologers about how the upcoming crops will turn out. Whether the harvest season be fruitful or not? Some of the foods are interpreted as follows: if they prefer water, there will be plenty of rain that season. Similarly, if cereal is chosen, the harvest will be bountiful. Another prediction is made based on various clothes of different lengths that lie in front of The Lord of the Harvest who is supposed to pick one of them, through which the exact amount of expected rainfall that will happen in the growing season can be predicted. Although the ceremony is based on Brahmins beliefs, the Burmese Royal ploughing ceremony also reflects Buddhist tradition. According to Buddhist tradition, Prince Siddhartha, the Buddha himself performed his first miracle in this ceremony when he mediated under a rose apple tree. Ever since the advancement in technology, Thailand earns most of its finance from exporting electronics, however from several years, the main export of Thailand was based on agricultural products; it still plays a great role in increasing Thailand's GDP each year. Apart from being significant in the exports, agriculture also proves to be very important for the locals of Thailand especially people who live in rural areas. Knowing how to grow your own crops turns out to be a super important skill to have sufficient food that can last throughout the year. How is the Royal Ploughing Ceremony observed? The Royal Ploughing Festival is celebrated at Bangkok's Sanam Laung in a public square open field in front of the Grand Palace and Phra Kaew. You'll observe that all government offices are closed on that day, whereas banks will be open. Post offices are open for half a day. Alcohol sale is legalized. Visiting a festival in an unknown location can be exhausting since you don't know the places. It is recommended to wake up early in the morning to witness this famous Royal ploughing ceremony. You can easily spot any tuk tuk or taxi and they will better know the place to drop you. They are more likely to drop you in the general area where you will see a huge crowd who will be heading towards the same destination as yours, follow them. Once you reach the main location, you will see that the ceremony is divided into two parts. The initial phase is basically receiving the blessing from Buddhist and takes place in Grand Palace complex. The later phase includes a ritual (Hindu origin) which is held at Sanam Laung and is considered as a primary activity. It begins with a king or an appointed lord and the queen or an appointed deputy's visit to the field where they move around 3 times. The king is responsible for the harvest while the queen sow seeds on their round. After the third circle is completed, both the king and the queen stop in front of a Brahmin shrine where cows (a sacred animal in Hindu religion) are brought outside and served with food on 7 silver trays. Our tours can be customized. If you are not interested in the above tours, just tell us your interests and requirements, and we will help you tailor-make a Royal Ploughing Ceremony tour.